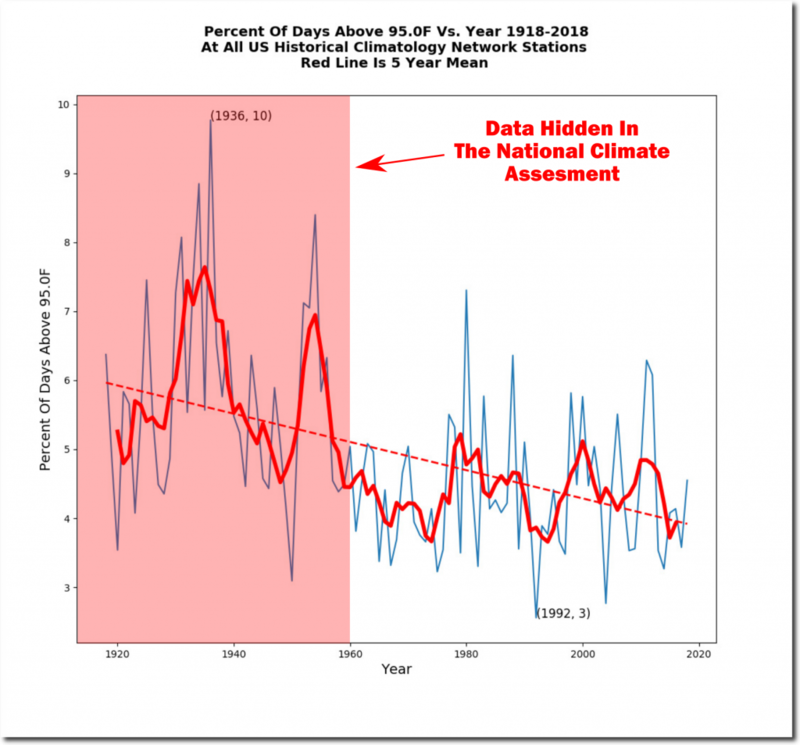 Katharine Hayhoe’s and Michael Mann’s National Climate Assessment is laced with fraud, starting in the first chapter where they claim heatwaves are becoming more common in the US. 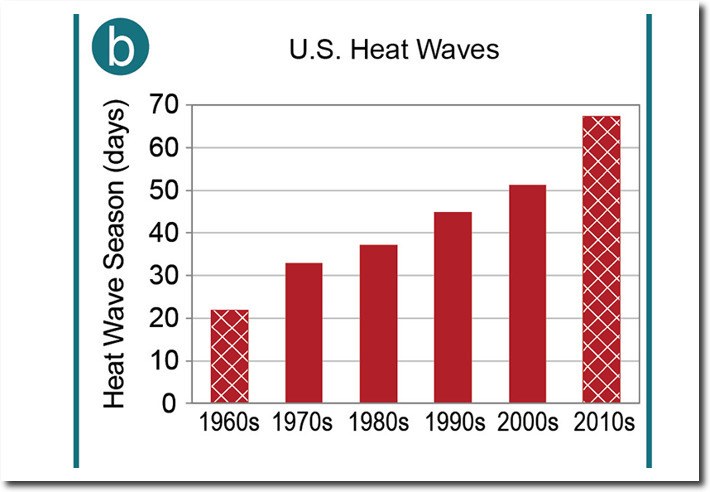 The frequency of hot days has plummeted in the US over the past century, down nearly 50% since the 1930’s. 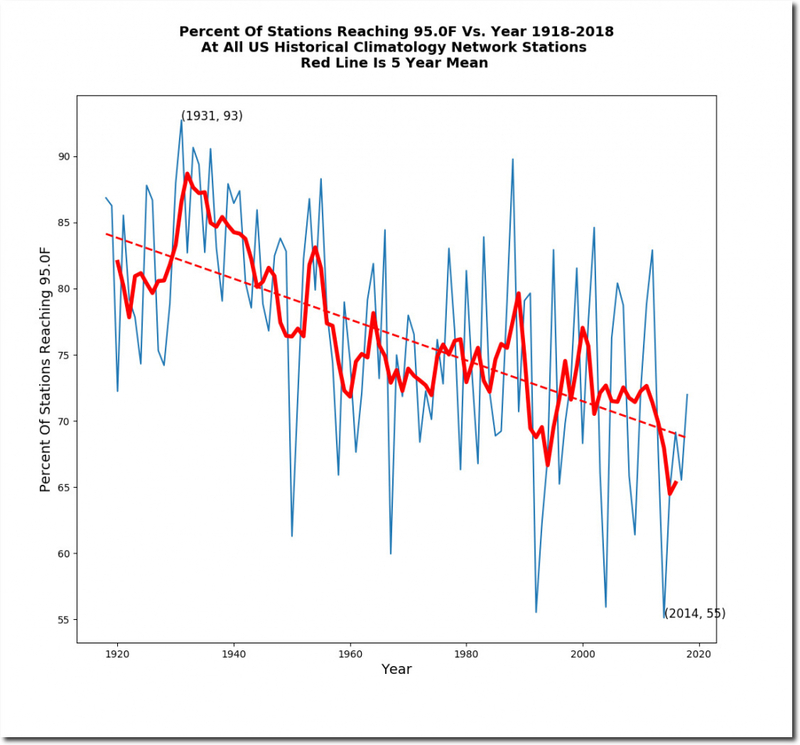 The percent of the US reaching 95 degrees sometime during the year has plummeted, with recent years being the lowest on record. 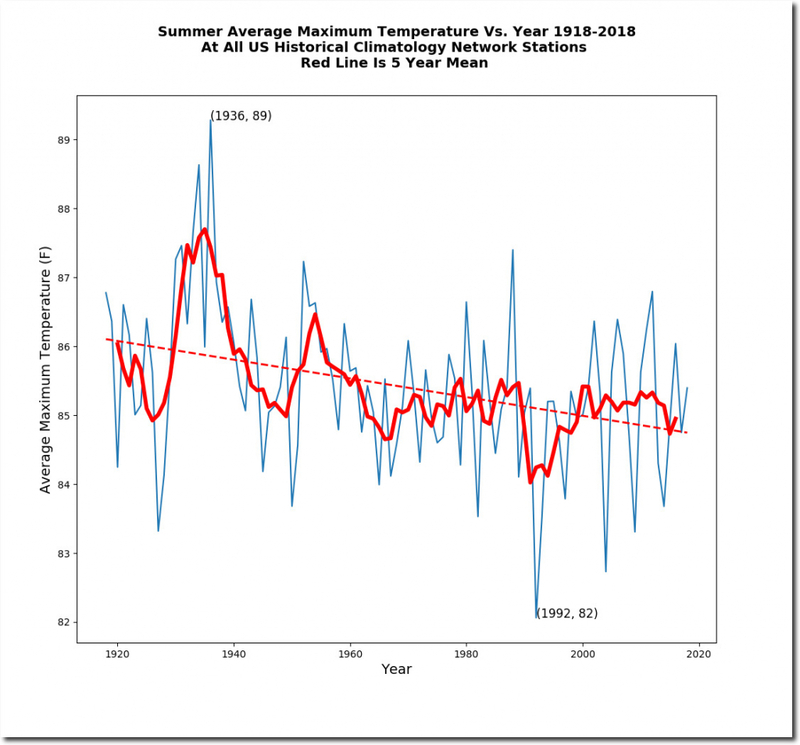 The average summer maximum temperature has plummeted over the past century. 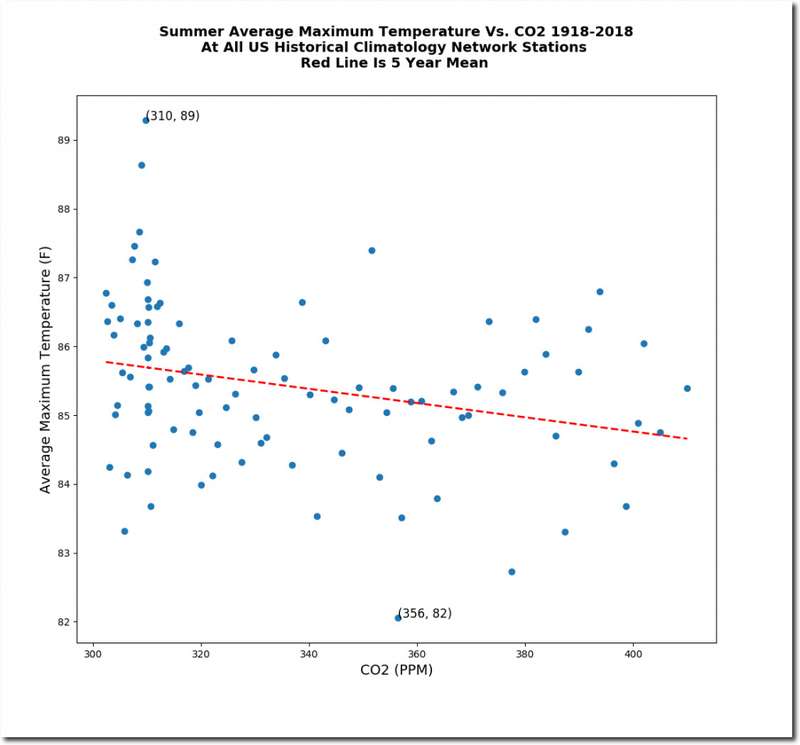 As atmospheric CO2 has increased, US summer temperatures have declined. 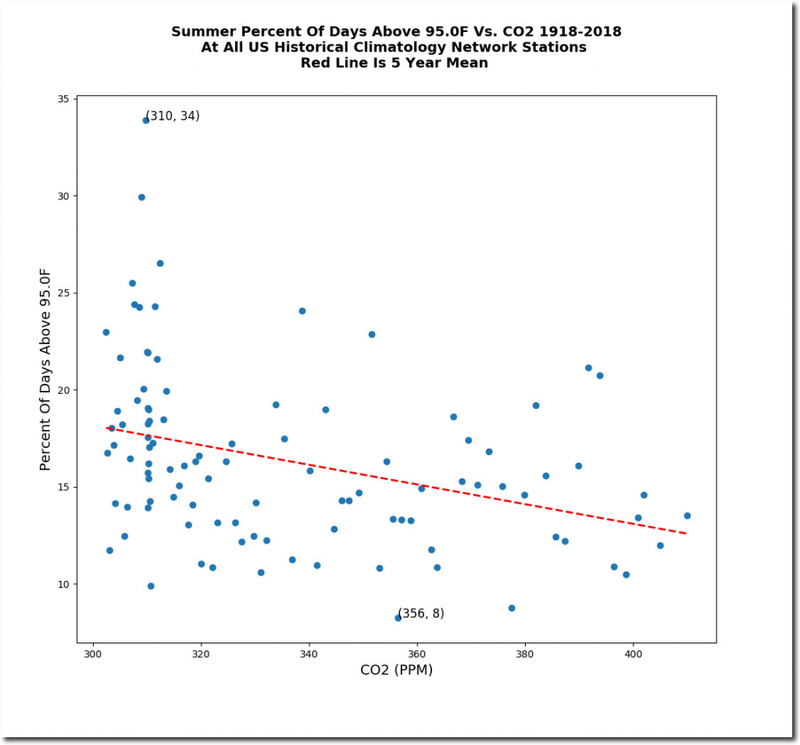 As atmospheric CO2 has increased, the frequency of hot days in the US has declined. 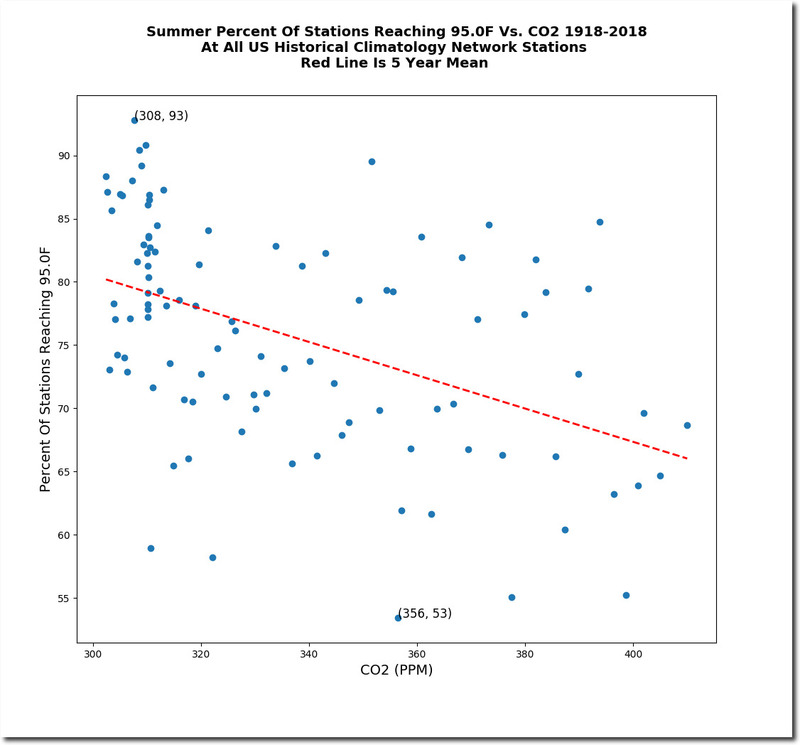 As atmospheric CO2 has increased, the percentage of the US reaching 95 degrees has declined. Their fraud is centered around hiding data prior to 1960. Not hard to see why they are doing this. 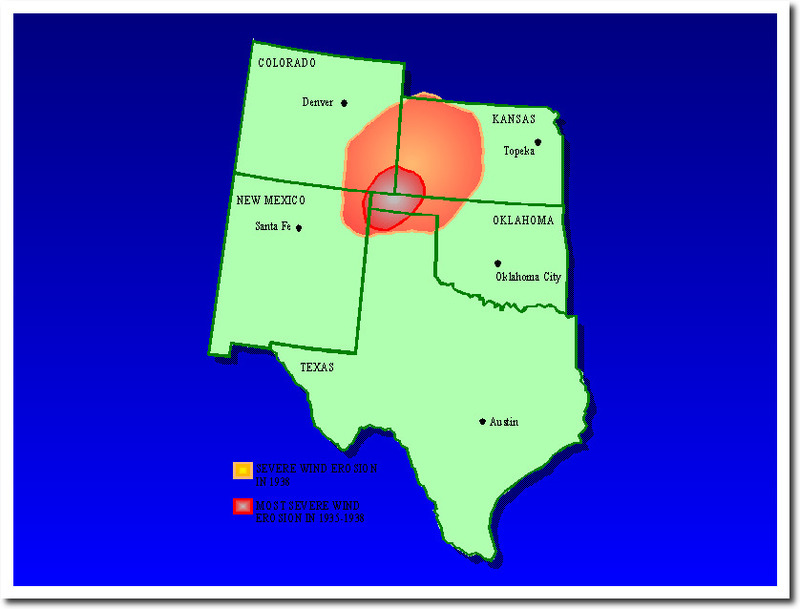 They blame the hot weather prior to 1960 on farmers in the Oklahoma Panhandle, and use that as an excuse to hide it. 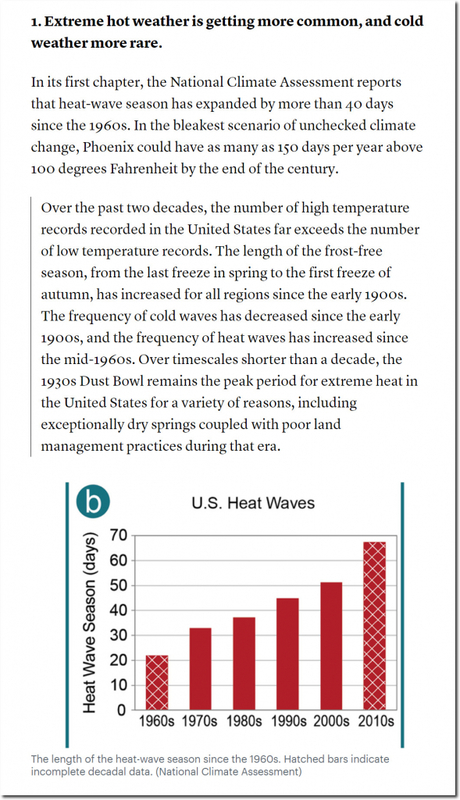 Over timescales shorter than a decade, the 1930s Dust Bowl remains the peak period for extreme heat in the United States for a variety of reasons, including exceptionally dry springs coupled with poor land management practices during that era. 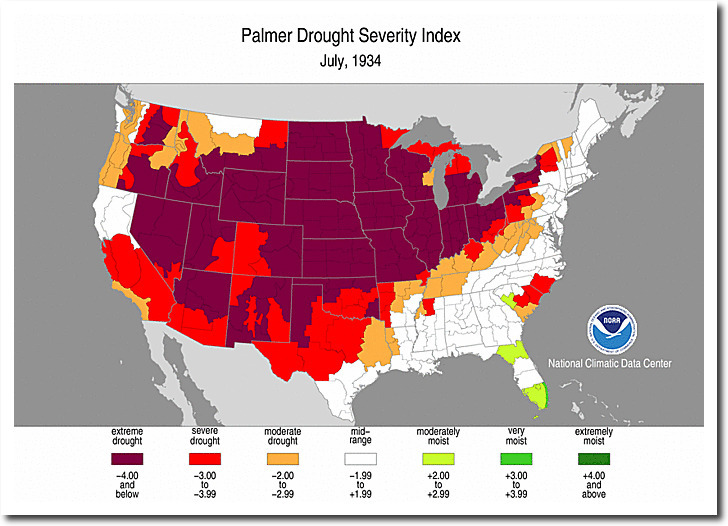 To get a feel of how dishonest this is, compare the area of the Dust Bowl to the area of the 1934 drought. 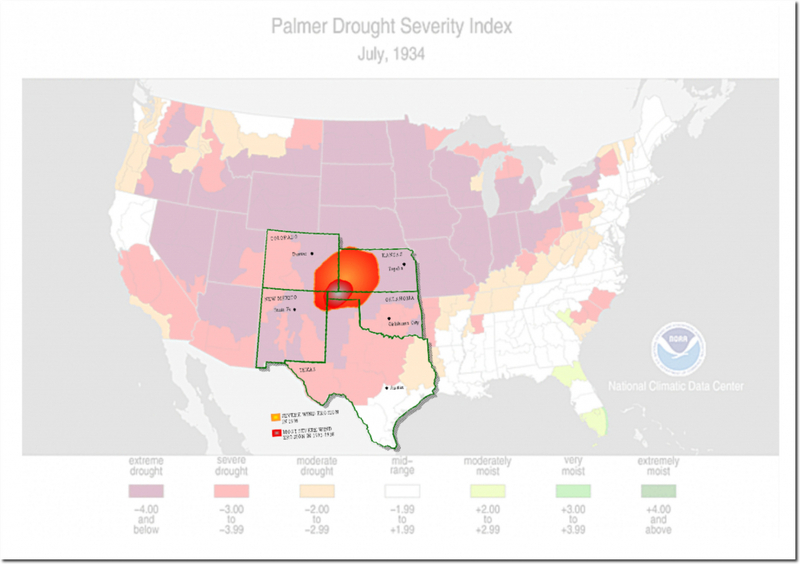 I overlaid the Dust Bowl region on the drought map, to show how dishonest their attempt to blame farmers is. 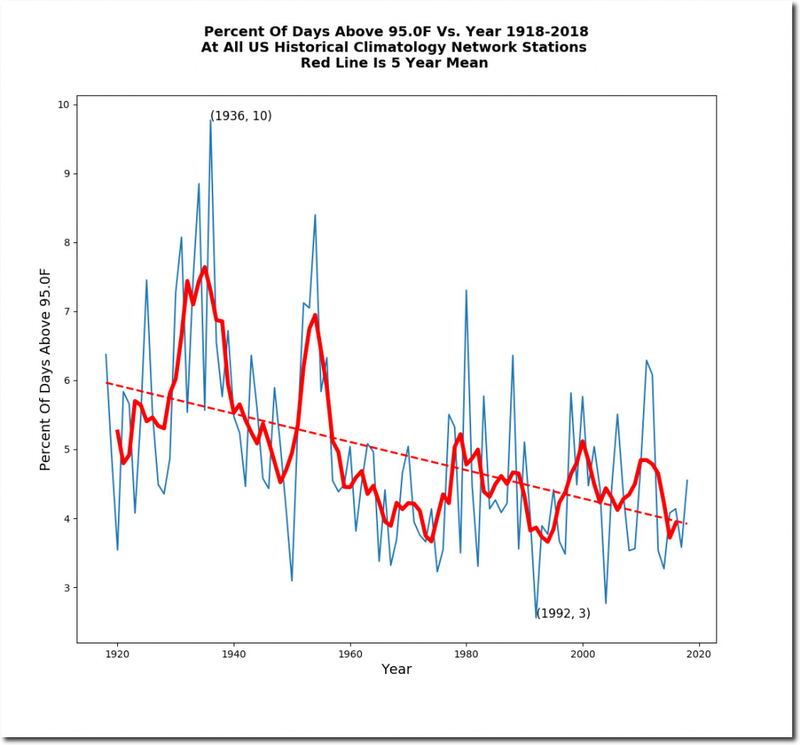 Then they claim that the frequency of 100 degree days is increasing in Arizona due to climate change. This is another trivial to disprove lie. Outside of the urban heat island of Phoenix, the frequency of 100 degree days in Arizona is plummeting. I sat with Hayhoe and Mann at the opening of Naomi Oreske’s propaganda movie in 2015, Merchants of Doubt. 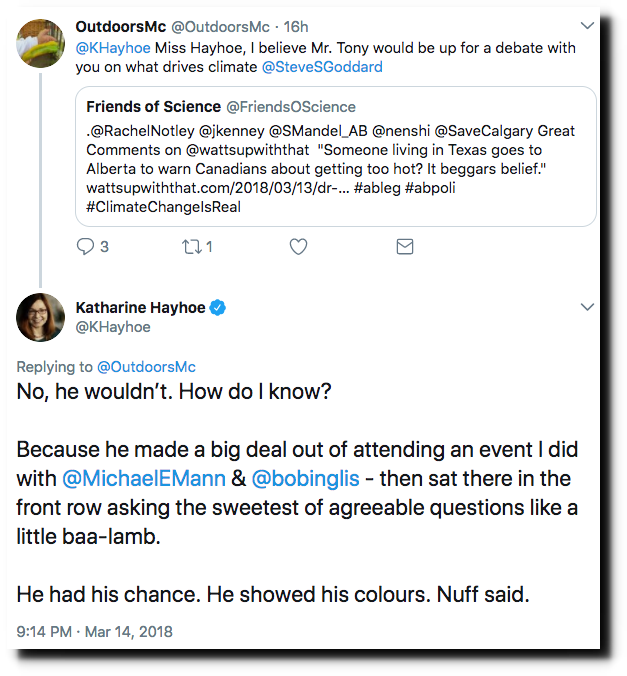 Katharine says she won’t debate me and has me blocked on Twitter -because I am too sweet and agreeable. Of course the real reason she won’t debate me is because she knows that I would expose her as a world class liar and fraud.